The Real Billy Sunday: The Life and Work of the Rev. William Ashley Sunday, D.D. 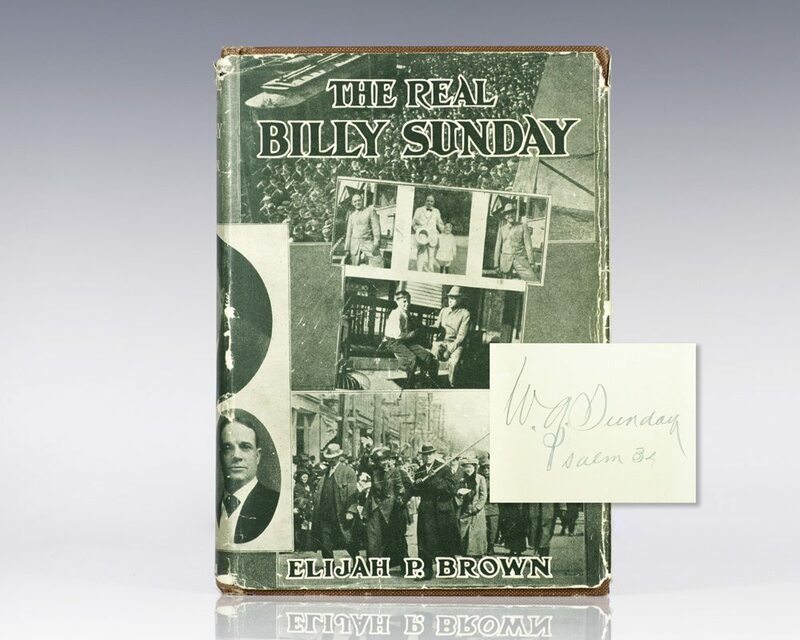 Sunday, Billy) Elijah P. Brown. Dayton, OH: The Otterbein Press , 1914. First edition. Octavo, original cloth. Boldly signed on the front free endpaper, “W.A. Sunday Psalm 34.” Light rubbing to the cloth, near fine in a very good dust jacket with some wear and a chip to the crown of the spine. Illustrated throughout. Books signed by Billy Sunday are rare. William Ashley "Billy" Sunday was an American athlete who, after being a popular outfielder in baseball's National League during the 1880s, became the most celebrated and influential American evangelist during the first two decades of the 20th century. Sunday's homespun preaching had a wide appeal to his audiences, who were "entertained, reproached, exhorted, and astonished." Sunday claimed to be "an old-fashioned preacher of the old-time religion"and his uncomplicated sermons spoke of a personal God and following the moral lessons of the Bible.